In 2016, Bashang Village began to develop tourism, taking advantage of these “red” resources. The Jinggang Mountain was designated as a national youth education center of modern history. Taking this opportunity, Bashang Village invested more than RMB 500 million and developed a program named “A Day in the Red Army.” In the program, themed activities like rapid marches, Red Army meals, home visits, and Red Army story sharing are included. Every year, more than 40,000 tourists participate in the program to get a taste of the Red Army soldiers’ daily life. In the village, tourists dressed in Red Army uniforms are a scene to behold. People from all across China attend to experience firsthand a day in the life of a Red Army soldier. “All the drills, presentations, and field study have made my day,” said Yue Guiyong, a student from Baoding College, Hebei Province. Due to the popularity of the experience program, the local people’s life has seen improvement. Wu Yunyue is a resident of Bashang Village. She lost her husband to disease years ago, and led a tough life raising her two children alone. Before 2013, her whole household relied on income from planting rice and raising pigs. Even when there are errands for Wu to make extra money, she can earn no more than RMB 17 a day. In 2013, Wu participated in the preparation for the “Red Army meals,” and that year she earned more than RMB 3,000. By 2016, Wu had catered to more than 1,000 visitors, earning a net income of RMB 15,000 per year. “Sometimes I will also do some errands in the village to earn extra money. My son can make about RMB 20,000 a year, so now our income reaches nearly RMB 40,000 every year.” Wu said, with a content smile. July is the peak season for tourism. During this time, Deng Zhuxiang’s family is particularly busy. Providing visitors with authentic farmhouse meals has become an indispensable part of Deng’s daily life. On a regular day, she is busy in the family kitchen, minding the steamed dishes on the brick stove, and at the same time stir-frying the vegetables harvested in the backyard. The dining cost is RMB 33 per person. A table for 10 can generate a net income of RMB 180 for Deng’s family, which brings much needed financial relief for her. Since May, an abandoned primary school in the village has been transformed into a “red education” base. Bashang Village has welcomed new visitors – children coming for summer camps. “A single-bed room costs RMB 30. A twin-bed room costs RMB 50. And an air-conditioned room costs RMB 80.” In early July, Deng’s family hosted 14 elementary school students at the summer camps for a few days, adding another RMB 1,000 to 2,000 to her income. “Bashang Village will soon sign a cooperation agreement with Nanchang Tiange Education Group to promote summer camps and outward bound training. 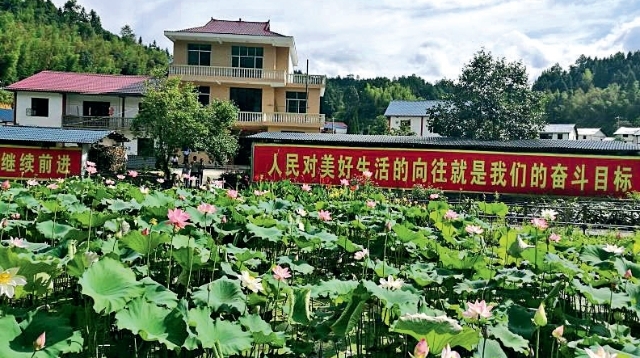 By then, Bashang Village will be able to accommodate 200 additional students per day.” Seeing that a one-off investment can bring sustained and substantial income, Li Guofeng, Party secretary of Bashang, is urging the villagers to follow Deng’s example, and transform their farmhouses into homestay options for students at the education base. It can increase Bashang’s popularity, and open up new channels for farmers to get rich. According to Li, “We must ensure growth in both the village’s collective economy and the villagers’ income, and build up the village and households together. In line with such requirements, Bashang Village has made further progress this year in poverty alleviation, seen homestay flourishing, intensified efforts in environmental remediation, and continued to increase the village’s collective income. We will transform our historical and natural resources into development advantages for rural tourism and red tourism.” This year, Bashang Village has further improved its environment, and elected model households with the most beautiful courtyards. Deng’s family ranks among them. Moreover, solar power generation alone can bring RMB 80,000 of income to the village’s collective economy this year.